“Hundreds of thousands of hardworking Chicagoans earn the minimum wage across our city and struggle to provide the most basic necessities for their families. 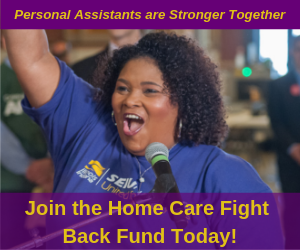 Toni Preckwinkle’s plan to put our city on a path for a $15 per hour wage would lift up 400,000 workers, many of them healthcare and child care professionals represented by our union. “Mandating a $15 per hour minimum wage for every Chicago worker is not only the right thing to do, it will serve as a catalyst to our city’s overall economy by putting money right into the pockets of those most likely to go out and spend it. “Purchasing food, filling up a gas tank, paying rent, and worrying about one’s child having a warm winter coat keep too many Chicago moms and dads up at night. Despite getting up and going to work day in and day out, their paychecks still don’t stretch far enough. In fact, the average minimum wage worker must work over 80 hours a week to meet the most basic needs. “While critiques of lifting up the minimum wage have argued that lifting wages—and alleviating poverty—comes at the expense of job growth, the fact is that Chicago has added 80,000 new jobs during the same period that the minimum wage has been increasing incrementally to $13. 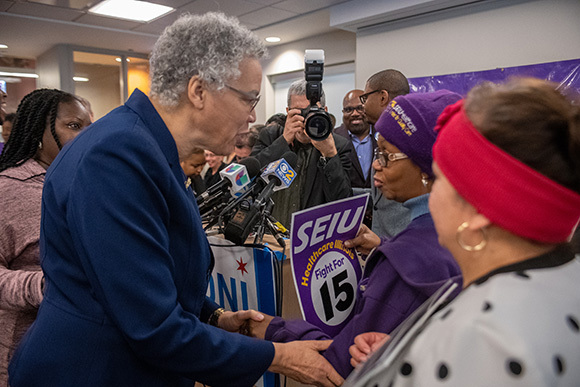 “In Toni Preckwinkle, we have a proven leader who understands that lifting the Chicago minimum wage to $15 is good for working families, good for job growth and good for Chicago’s economic future. “We need her kind of experienced leadership in the Mayor’s office, advancing policies that lift up all of Chicago, including the working families that have been left behind all too often in the past.